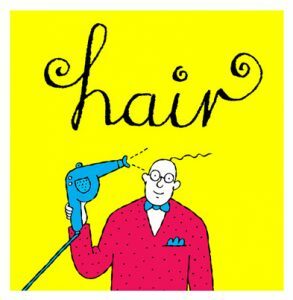 This piece was the result of some research for a book all about hair I wrote and illustrated for Walker Books some years ago. Fascinated by the subject, I probably did far too much research, but enjoyed every minute of it. 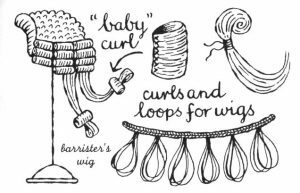 As well as going to an event at London’s Moustache Club, investigating baldness cures etc., I spent a morning drawing and chatting with a group of women who make legal wigs, in a rather Dickensian London basement. Mothers and grandmothers of some of the women had been wig-makers too. “Would you like to see something special?” I was asked. They showed me a battered tin with a square of black silk inside it. This would have been placed on top of a judge’s wig when sentencing someone to death for committing murder. It hadn’t been used since 1964, when the last person was hanged. I started being interested in hairstyles when I was a child – I hated having my hair brushed and combed. 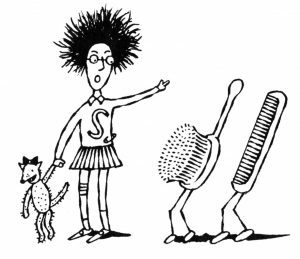 As I warning, my grandmother – I was living with her at the time – showed me a picture of Struwwelpeter as a warning of how I’d end up, but I was inspired by his wild locks. My hair is a bit calmer now, though I do have a blue streak in it. Do you have a fantasy hairstyle? On June 16th I’ll be running a workshop at The Library Space where you can draw yours, inspired by the most excellent exhibition Hair! Human Stories. And by my book of course. This entry was posted in Books, Drawings, Events, Workshops and tagged children's book illustrations, children's book illustrator, childrens books, Hair, hair published by Walker Books, Hair! 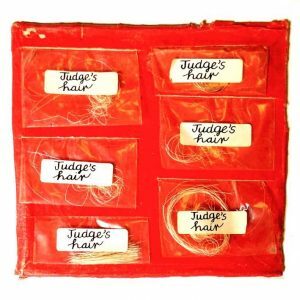 Human Stories exhibition, hairythreads, illustrations, pena dn ink drawings, Sally Kindberg's Hair book, Struwwelpeter, The Handlebar Club, The Library Space, walker books, wigs. Bookmark the permalink.